Debating the top 3 voiceover mics is sort of like debating who was the greatest boxers in history or the greatest major league slugger of all times or who was better, Biggie or Tupac. And I display my biases proudly. Muhammed Ali would’ve outsmarted Mike Tyson and won. Hank Aaron hit 755 home runs without steroids and Biggie was a talented lyricist and not just a rapper. And as goes the subjectivity of those debates, so goes the debate about voiceover mics. I had a chance to sit down with Chris Courier at VO Atlanta and here his take on the subject and why. Thinking back on my own experience with microphones, I remember not knowing where to turn. When I started in 2004, I was using other people’s studios for my occasional voiceover work so I was subject to whatever they were using. I didn’t know many voice actors to ask and there weren’t as many blogs with the information readily at hand. So I turned to my brother who was a music producer and singer at the time. He made several suggestions. The first being the microphone that he used in his studio which was the Neuman U87. I had recorded in his studio before and loved the way I sounded but knew that the price point for a starting voiceover talent was way too high. 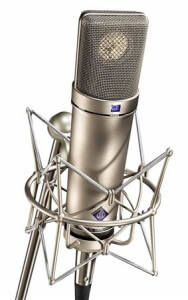 The second being the Neuman TLM 103 which like the U87 was also a condensor mic. He said this mic would be perfect for me. But at the time, it was still nearly $1500. I sighed deeply and dreamt many nights of the ways to get my dollars for that purchase. If only someone would gift me one. With time passing and me still not owning any voiceover mic at all, my brother suggested a third option, the Rode NT1A. This mic cost $200 and was closer within reach. I decided to buy it for myself for Christmas, but I was beaten to the punch. My girlfriend at the time conspired with my brother and bought me the Rode before I had a chance. I didn’t have a audio interface at the time and this was a period when USB mics were just crap. They were basically only used for podcasters and were definitely not voiceover quality. So I purchased a EMU 1616 (which I still own and use) at the advice of a friend. From there I found my first regular client who I made a whopping $200 a week from. I was still working in the school system so I was able to save all of my VO money until I was able to purchase that nearly $1500 Neuman TLM 103 (The price is significantly lower now). After using the TLM 103 for many years I sought to build a better mobile studio. I had been using the NT1A with a crappy audio interface for a few years and didn’t get very good sound out of it. So following the footsteps of other top voiceover talent I purchased the Sennheiser 416 and the Micport Pro audio interface along with a Macbook Pro for my travel rig. Admittedly this was more of the Veblen effect than it was a purchase of needs. I’m not even a Mac guy and the Sennheiser also came with a pretty price tag. At the time, I didn’t even appreciate the difference between the TLM and the 416 and the 416 stayed mostly collecting dust except for when I traveled. It was with much persuasion from other talent like Jaye Delai that made me give it a fair chance in my home studio. And since, I honestly haven’t gone back to the 103. Over the years I’ve heard from other talent about how good their mics are and how they compare to top more used microphones. Some honorable mentions have been the comparison of the $700 Rode NTG3 to the $1400 Sennheiser 416. Many newcomers looking for a voiceover mic to get started have looked towards USB mics which have gotten better over the years. The Audio Technica AT2020 is one that I’ve heard good things about and again also Rode has an offering of the NT-USB which I had a chance to hear in action while interviewing fellow voice talent down in Australia. 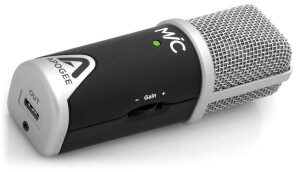 The Apogee Mic has come up as a favorite several times when discussing microphones that record with Ipads and Iphones although unfortunately is not a solution for for we android users. Otherwise I’d own one already. But the best thing I’ve ever heard about voiceover mics came from a story that I heard Mitch Faulkner tell at VO Atlanta 2016. He said someone asked him about what microphone he was using to get his great sound and he told them, which at the time was not a top of the line mic. He said the person stood with disbelief and challenged him to prove that he was really using a “low end mic.” So he took the same mic connected it again and did some EQ-ing on it, spoke on it and emulated the sound again of a high end studio recording. He said “It doesn’t matter what microphone you have if you don’t know how to use it.” And he’s right. From EQ-ing to mic technique, if you’re using that U87 wrong then its wrong. And if you really know what you’re doing, you might be able to get away with using a Shure SM-58 effectively to sound like a great studio offering. Dane Reid is a New Yorker, living out his dreams from Atlanta as a voiceover talent and Globetrotter. Please subscribe to this page for email updates on new blogs.